Dr Carol Helfer of Canine Peak Performance took this little video of Ali last week during his weekly underwater treadmill session. This day marked the one-year anniversary of Ali’s second spinal surgery. To think about how far he has come in the past year…truly amazing. 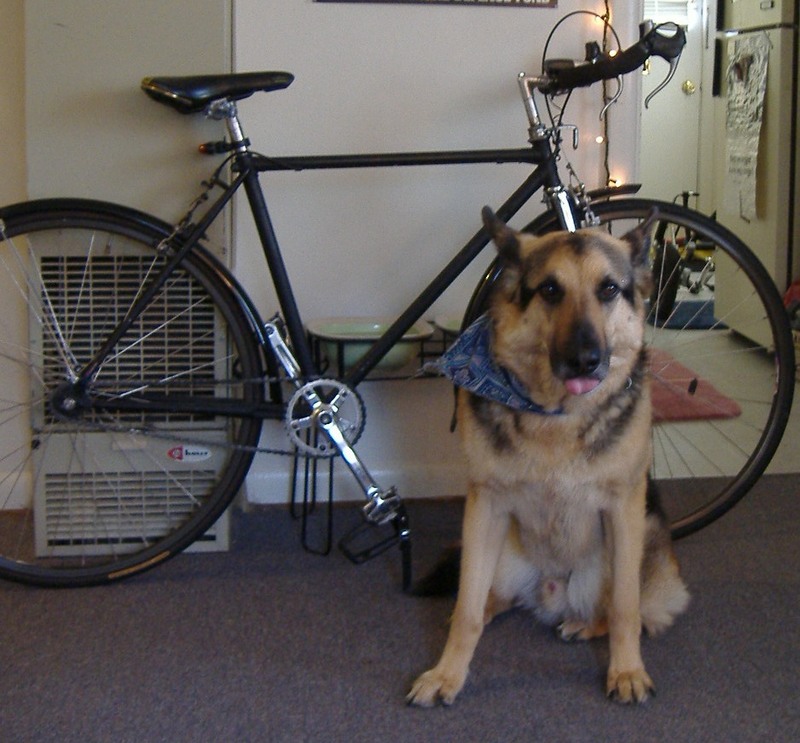 Your dog or your bicycle? I had the strangest argument with a very good friend of mine the other night after she asserted that a mutual friend’s feelings for his bicycle were the same as my feelings for Alec. If I had just ignored that comment, the argument would never have ensued. But I was honestly shocked to hear this come out of her mouth. Even if she thinks my feelings about Alec are comparable to another friend’s feelings about an inanimate object, the fact that she would not think twice about voicing this opinion to me was definitely weird. Weirder still was the fact that she would not budge one inch from this assertion, even as she apologized for the fact that I took her comment “the wrong way.” As I repeatedly gave her the opportunity to explain what exactly I had gotten wrong or misinterpreted, she simply repeated the same thing using slightly different words. It was surreal. Let me back up. This friend dearly loves both Ali and me. And we both love her. She is one of my best friends and I respect and admire her greatly. In fact, I had just flown her up from San Francisco so she could stay at my apartment and take care of Ali while I was in Boston last weekend for work. She is one of the few people with whom I fully trust post-injury Ali. The cost of her plane ticket and food for her stay was around $300, a sum I could have easily reached paying a random pet sitter stay at my house for three days, and Ali knows and loves her, so I was amazingly grateful she took those days off work and time out of her busy life to come to Portland to watch him. This is a good friend! And her love for Ali (and her own dog) is unquestionable. So why does she think Ali can be compared to my friend’s bicycle? I’m not sure. The argument was heated and we came to no resolution. She tenaciously defended her position. Now, the bicycle-loving friend in this scenario truly does love his bike. One could even argue it is the center of his life. He has no car and depends on his bike for work. Using a bike as his sole mode of transportation is also a political statement for him, and his bike certainly holds more meaning to him than it would for the average person. No question. One might even say his bike is his friend. And yet… does he really feel about his bike the way I feel about Ali? Is that even possible? A big point in her argument was that the friend in question is about to pay $50 to ship his bike to San Francisco for a 10-day trip rather than ride a borrowed bike. Okay, even if I did want to engage on the level of how “much money you spend on a person or object indicates your feelings for said person or object,” with my ongoing expenses for Ali and the cool 16k in vet bills he racked up in just two weeks last year…well, sadly, I probably do have him beat there too. No matter how important a material object like a bicycle or any other treasured possession is in someone’s life, no matter how much meaning that thing holds for them (and knowing several people who are crazy for their bikes, I understand the point), can this feeling ever truly compare to the emotional bond one feels with a sentient being? Obviously, I think not. The fact this good friend of mine and Ali’s, who is also a wonderful guardian to her own dog, disagreed enough to argue this point until neither of us had any breath left is indicative of just how far from the mainstream my views are regarding my relationship with my dog. (I use the possessive but not to objectify him – I am “his” as much as he is “mine,” in the best sense of those words). So for those of you who understand why I was shocked and offended by her comparing Ali to a bike in this manner, I want to thank you. You are my kindred spirits in a world where animals are not only defined within our antiquated legal system as mere property with no more worth than a chair (and in the case of a shelter dog, definitely worth less than your expensive bicycle), but also are regrettably often conceptualized in similar terms even by those who love them.